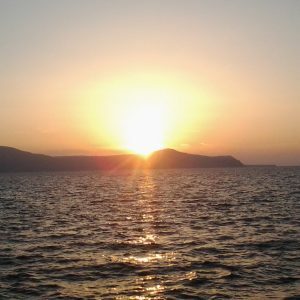 An early departure, setting out for the longest individual crossing on this itinerary: from Kalymnos in the Dodecanese archipelago to Amorgos in the Cyclades. Since late morning, our boat is moored in the port of Katapola, the harbour of ancient Minoa, one of the three historic city-states on Amorgos. 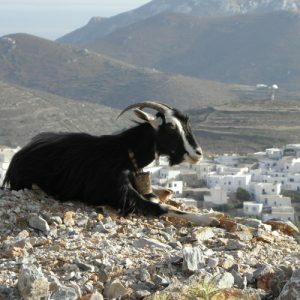 Our day on Amorgos had two highlights. One was the Chora, the historic capital village of Amorgos, one of the prettiest settlements in all of the Cyclades, a labyrinth of twisting stepped lanes and whitewashed and blue-shuttered houses that exudes a joyful quirkiness and a sense of peaceful modesty from every corner. We’ve written about it before, and it is always a deeply satisfying experience to explore it, and to take in the whole village from the walls of its tiny Venetian castle set on a rocky outcrop overlooking its homes, squares, innumerable chapels and the row of cylindrical windmills set on a ridge above them all. We had a very lovely village lunch there, including many local specialities, including an artichoke stir-fry, a Greek salad based on superbly tasty tomatoes and a juicy dish of slow-cooked goat and potatoes. Before the Chora, however, we saw the island’s most famous monument, the monastery of the Panagia (or Virgin) Chozoviotissa. It is one of the strangest structures in the Greek islands: built against a sheer cliff high above the southern shore of Amorgos and overlooking the bluest sea you can imagine, the monastery is an extraordinarily narrow and tall building, dominated by a system of stairways connecting its many levels, housing the chapel, the monks’ cells, refectory, library and whatever other spaces were required. In a way it is as if someone had assessed the challenge of building in this vertical cliff-side location and decided to take an extensive single-story building, shift it by ninety degrees on a horizontal axis (i.e. making it vertical) and stick it against the rock. The Chozoviotissa monastery is actually partly cut into the rock and partly built against it. One of the strangest results of this unusual position is that the top floor, housing the monastery’s main chapel, is actually the oldest part of it. The history of the Chozoviotissa is somewhat mysterious. Its official story entails its foundation in 1088 by the Byzantine Emperor Alexios I Komnenos, at the site of an earlier establishment, its origins shrouded in the legend of the highly revered icon it houses, said to have been saved from the monastery of Choziba in Palestine (which is built in a very similar cliff-side location and goes back to the 5th century) during the age of iconoclasm, when icons were outlawed. 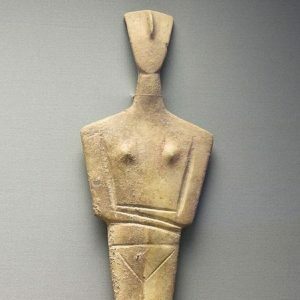 None of the early history of the Chozoviotissa can be proved – or disproved – easily, as the earlier written records are now lost, but it seems clear enough that we are looking at a stucture that has been modified and added to on many occasions, and that may well go back the nearly thousand years it claims. The dignity of the venerable structure, the quiet serenity it imparts on us and our guests, the stupendous views it offers and the impressive sight it provides by itself, its now whitewashed bulk sitting against the brown and grey of the cliff face, make the visit a uniquely memorable experience. It is added to by the hospitality of the monks (the Chozoviotissa has three at present), who serve their visitors loukoumi (Turkish delight), water and rakomelo, a speciality of Amorgos (and other places), grape spirit flavoured with honey, cinnamon and cloves. 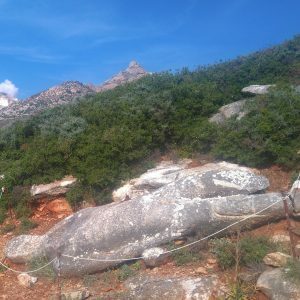 As applies to all the islands we visit, there would be more of interest to see on Amorgos – but it is part of the nature of a cruise like ours to make a selection. Each island is worth returning to for further exploration, and we could show our guests more sights on nearly all of them – something we occasionally make use of when we are delayed by circumstances beyond our control. We completed the day with a very fine seafood dinner in the port of Katapola. Tomorrow, we hope to set out northwards and westwards, to reach Delos.